Since their invention, dental implants have provided durable, safe, and lifetime-lasting solutions to millions of patients – whether they’re missing one tooth or multiple teeth. If you’re fed-up with a smile that makes you feel unconfident or a mouth that just doesn’t function as effectively when talking and chewing, then dental implants may be the perfect solution for you. 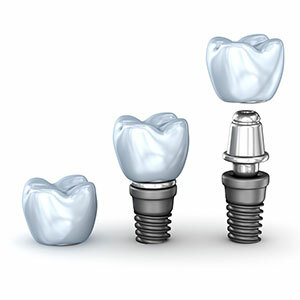 Dental implants can be likened to an artificial tooth root, resembling a titanium screw in appearance. This ‘root’ is then securely attached to the jaw bone, ready for a fixed restoration to act as the prosthetic tooth or teeth (such as a crown, denture, or bridge). Dental implants are the most natural-looking and feeling restorative dentistry option, helping patients to regain function of their mouth again, along with a beautiful smile that no longer contains missing teeth. Although many dental practices offer dental implantology as a service, John Appleyard Dental has the in-depth experience and qualifications in this area that you can rely on. Not only has Dr Appleyard been practising as a Dental Surgeon since 1981, but in 1992, he traveled to Sweden to undertake Surgical and Prosthodontic (Crowns/Bridges & Implant Supported Solutions) training at the prestigious Branemark Institute for Dental Implants and Oral Rehabilitation. Additionally, John is an Accredited Implant Surgeon/Practitioner from the University of Gothenburg, where original modern Oral Implants were invented and rigorously scientifically researched. John has surgically placed and restored well over 1,000 oral implants in his career, with this figure growing significantly each year. Furthermore, in 2018, Dr Tony Tao traveled to the University of Cambridge to obtain a post-graduate diploma in dental implantology. The dental implant process can occur in as little as three stages and it is a relatively straight-forward procedure. During the initial stage, the implant is placed into the jaw, before a waiting period of approximately 3-4 months occurs to allow for the fusion of bone and gum tissue (osseointegration). Once this occurs, our dentist gently uncovers the screw, before the patient’s permanent restoration is fixed in place. Are you interested in regaining a more beautiful, confident and functional smile? Schedule a consultation with John Appleyard Dental today to see how dental implants can help you!